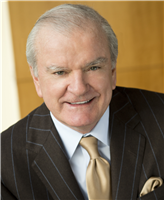 Donald E. Godwin is considered one of the most respected and tenacious trial lawyers in Texas. For over 40 years Don has tried significant jury cases in courts throughout Texas and across the United States. He has the ability to translate complex matters of law and fact into easily understandable language for courts and juries. Don's practice covers a broad range of areas with an emphasis on complex litigation, including oil and gas, environmental, fiduciary duties, will contests, major family law disputes and business torts. Notably, he has acted as Lead Trial Lawyer for Halliburton in the Firm's successful defense of the company in all civil litigation and investigations concerning BP's Macondo well blowout (Deepwater Horizon) in the Gulf of Mexico. Don was the lead counsel for Halliburton in its asbestos and silica litigation. He negotiated the global settlement of Halliburton's approximately 382,000 asbestos claims throughout the United States that took him approximately one year to accomplish. In addition to being recognized as a leading trial lawyer in the United States, Don has also earned the reputation among corporate executives, their legal departments, and other highly visible individuals as a master negotiator where the risks are substantial and the future and successes of such clients are on the line. Don is Board Certified in Civil Trial Law by the Texas Board of Legal Specialization. He received a J.D. from Southern Methodist University Dedman School of Law in 1973, an M.S. in Accounting from Memphis State University in 1970 and a B.S. from the University of North Carolina in Wilmington in 1969. University of North Carolina - Wilmington, B.S.